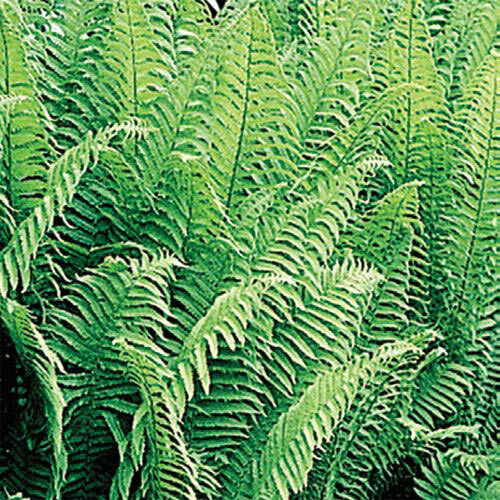 Glade Fern | Gurney's Seed & Nursery Co.
Rich jade-green foliage won't fade or yellow— eye-catching color lasts all season. Fronds stay full and fluffy, providing plenty of foundation coverage. Stands tall at the back of borders—3-4 ft. high. Bareroot. Zones 2-9. LightFull shade to partial sun. FoliagePlume - like to 4 feet, dark green, leathery foliage. Soil RequirementsMoist, humus, slightly acid soil. CommentsDivide in Spring before growth starts. Vigorous spreader. Special considerations; Keep soil moist, but not soggy. Mulch to help conserve moisture. Thicken mulch for the Winter. Incorporate generous amounts of peat moss, compost, or well-rotted, dehydrated manure deeply into the soil. Unique characteristics; Fronds shaped like tail feathers of a bird. Divide in Spring before new growth starts. Vigorous spreader. Plant with other varieties of ferns, Hosta (complementary), Bleeding Heart (complementary) Lily of the Valley (complementary), Astilbe (complementary). DepthPlant with the crown of the plant level with soil surface.